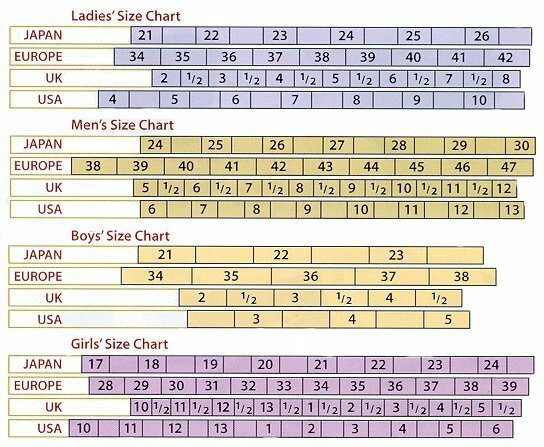 We are pleased to provide these shoe size charts which give the approximate equivalent UK, European, Japanese and USA shoe sizes. For more specific size recommendations, refer to shoe descriptions under each style. When your shoes arrive try on both shoes as one foot is normally a different length and shape than the other. Dance shoes are generally worn smaller than you would wear your regular street shoes. They must fit snugly without hurting so you maintain proper balance on the dance floor. This means that all parts of the shoes should be covered by your feet. If your feet move easily inside the shoes, you cannot properly control your balance or your dance posture. In closed-toe styles (ladies' and men's), the toes should be as close to the end of the shoes as is possible without actually rubbing. In the open-toe styles, the toes should completely cover the soles of the shoes and it is preferable is the toes actually "hang over the edges" of the shoes just a bit (up to a 1/4 inch). Buy today to dance tomorrow... in foot friendly shoes with eye catching appeal!